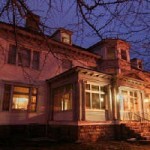 At the 1787 inn many friendly ghosts are said to reside. You may see spirits of a Civil War soldier in the upstairs hall or a former innkeeper in the tavern. A ghost named Elizabeth likes to throw things, slam doors, and stomp in the halls. She has been known to show herself to and have conversations with young children. Note: This inn may no longer be in operation. I SWEAR I DONT THROW THINGS!